This dual-screen handset will no longer reach the US market as expected "due to unforeseen delays including both production and delivery" of the US variant from the manufacturer. 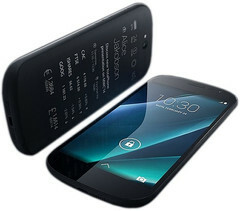 YotaPhone 2 is a unique device, bringing together a premium Android smartphone and a fully customizable always-on electronic paper display. With full Android functionality on both screens, this handset offers up to 100 hours of e-reading on a single charge and has been available in Europe since December 2014. In the US, it was expected to come thanks to an Indiegogo crowdfunding campaign that raised $298,058 USD, successfully closing on July 26. Unfortunately, things did not go as planned. Indiegogo backers recently received an email that one of them shared with The Verge. According to this email, "the reason for our cancelled launch is due to unforeseen delays including both production and delivery of the North American variant of YotaPhone 2 from our manufacturer." Yota Devices also added that "the logistics were insurmountable and the device would simply arrive too late." Since YotaPhone 2 reached the market in late 2014, and YotaPhone 3 might launch next year, it looks like the US market will never get it. On the other hand, the cheaper YotaPhone 2c is also expected to launch in the coming months. Both handsets have been officially confirmed back in May by Yota’s Managing Director for the Americas, Matthew G. Kelly. Unfortunately, he did not reveal any launch date, saying that "We can’t sell our next generation until we sell our current one. Carriers are interested, but a lot hinges on how well the YotaPhona 2 does." Let us just hope YotaPhone 2 is doing well enough in other markets so the next-gen Yota handsets come out and reach as many markets as possible.